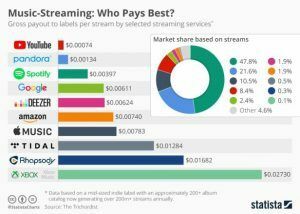 Music Streaming – what do they pay? RIAA reports digital revenues now account for 90% of all music consumed, with streaming taking up about 80%, downloads about 20%. 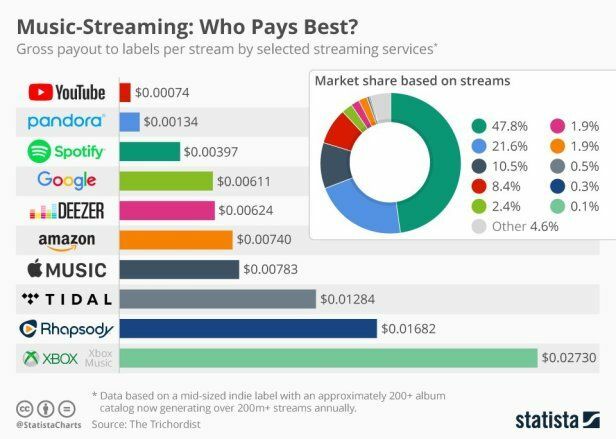 The music business is now the streaming business. The top 10 streamers account for 97% of all streaming dollars. Fun nightmare fact: almost 50% of all streaming music is experienced through Youtubes Content ID – BUT – they account for only 7% of the revenue. Read em and weep my friends. “Let’s fast-forward to this page, the interesting page. “Sirius XM, not bad. 1,509 spins, earned him $765 dollars. “Pandora: 38,225,700 spins earned him $278. “YouTube: 34,220,900 spins earned him $218.17. “Now I did the math for you guys. That’s on 20%. If he were to own 100% of the song, on YouTube he would have earned $1,100. “If he owned 100% of the song on Pandora, he would have made $1,400. I believe it is criminal. I believe it is unsustainable… it is unethical. With music licensing I made more on 1 song I write than 34,220.900 plays on YouTube (or Pandora). As an example I wrote a tune that MTV used repeatedly on a show. Every time the show played I made $300.00 ($150.00 actually after the split with Jingle Punks) The show repeats, rolls out to Europe etc, and the checks keep coming in for me every 4 months. Granted – I have no radio play (yet), and I am just taking one example… but Pandora is the same – and I would venture to say – most streaming is as well. It is horrible. Currently I don’t use any streaming services. Not streaming on these commercial sites was never a conscious plan… but at the moment it seems counter-intuitive if one wants to maintain control of their intellectual property / publishing / profits / creative sovereignty. Anyway – thought I’d share because if you are a musician, and you write – you need to be alert and vigilant. Til next time….